About Opossums: Opossums are unique animals. They are marsupials, which means that the mother gives birth to teensy tiny young that actually grow in a pouch. The opossum has a prehensile tale, opposable thumbs, and sometimes play dead. Possums frequently eat garbage and pet food, and often live under sheds or even crawl up into the attics of homes. Opossums are a common nuisance animal in southeast Pennsylvania. 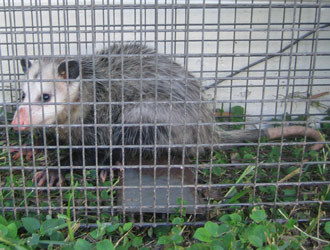 In Philadelphia and Montgomery County, possum have become a particularly common problem, as they have invaded many homes in the area. If you need a professional solution for your Philadelphia possum problem, give us at Philadelphia Wildlife Pest Control a call. Philadelphia Wildlife Pest Control Home Page - Learn about all of our services, and more about our animal control company. We service the greater Philadelphia area, including Delaware, Chester, Montgomery, & Philadelphia Counties. We service the towns of Upper Darby, Lansdowne, Broomall, Media, Brookhaven, Chester, Concordville, Newtown Square, Downingtown, West Chester, King of Prussia, Audubon, Norristown, Conshohocken, Willow Grove, and more. We do travel further for larger jobs, or schedule permitting, so if you are unsure about our service range, just give us a call! MY RESPONSE: Plastic owl = 0% change in opossum behavior Not leaving food out = 100% change in opossum behavior The plastic owl photo was a joke of course, and all animals care about is food. HaHa! Thank you for the insight. I loved your photos by the way. You seem to get a kick out of your job. Your sense of humor is unexpected from a wildlife relocator. Thanks for the advice! Tonight, operation rid-a-opossum begins.